Wyvern (4 cyl, 1442 cc, 35 bhp) - end of prod. Velox (6 cyl, 2275 cc, 55 bhp) - end of prod. 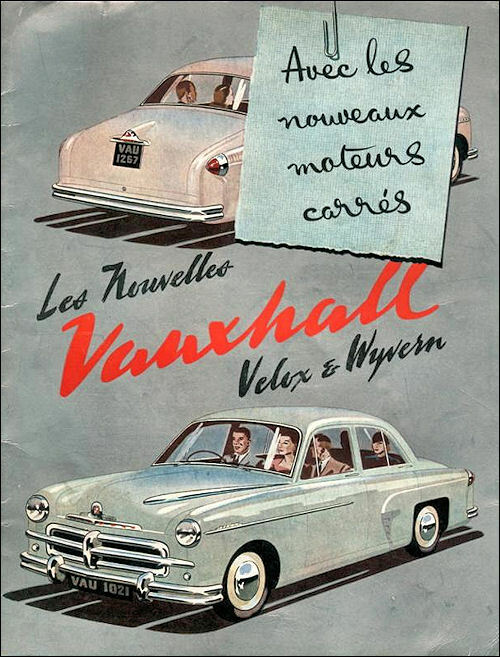 Vauxhall Velox (Model EIP) and Wyvern (Model EIX) Saloons, announced in August 1951, ARE the first really new post-war Vauxhall models. They feature full-width body styling, curved windscreen, 8 ft 7 in wheelbase and coil spring and wishbone independent front suspension. All doors are hinged at their front edges and has pushbutton catches. 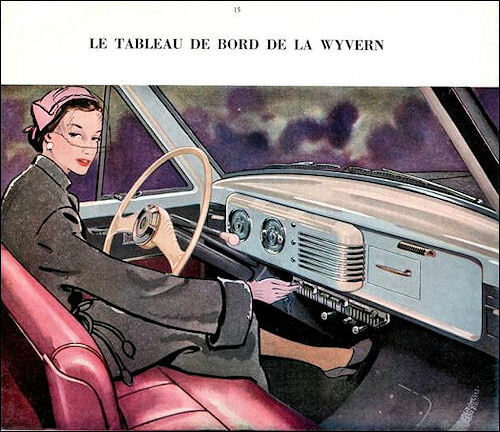 The four-cylinder 1½-litre-engined Wyvern is distinguished externally from the six-cylinder 2¼-litre-engined Velox by having wheels finished in body colours (cream on Velox) body-coloured flashes on the front wings (chromium on Velox) and different badges. As before the body is of unitary construction but separate chassis are produced for export to Australia where locally-made Tourer bodywork is fitted. 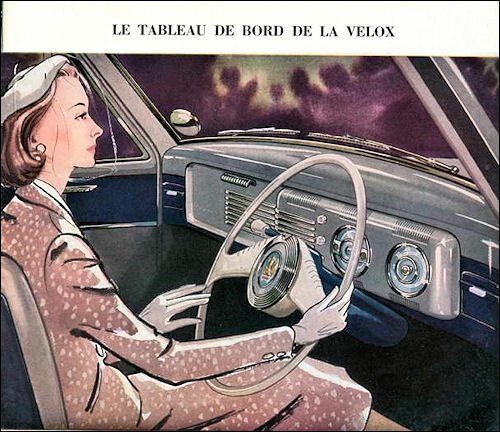 The bonnet could be opened from either side or removed altogether. Wyvern from 1952 short stroke 40 bhp 1507cc engine fitted, and plated stone guards on rear wings. 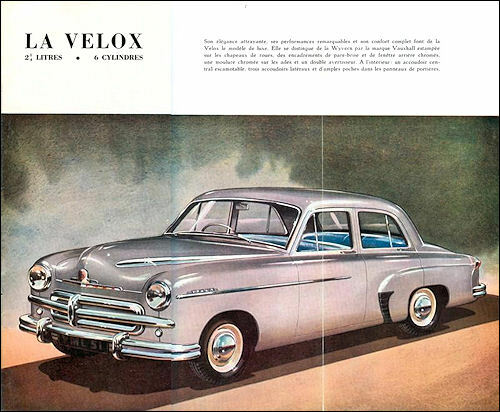 Velox short stroke 64 bhp 2262cc engine from April 1952. 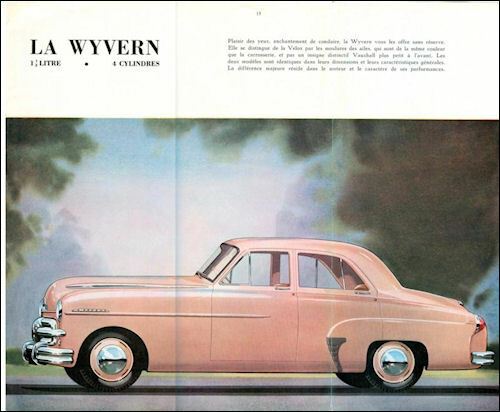 Identical in appearance to the models announced in 1951, the Vauxhall Wyvern and Velox cars which are now leaving the production lines at Luton are fitted with completely new designs of engine. 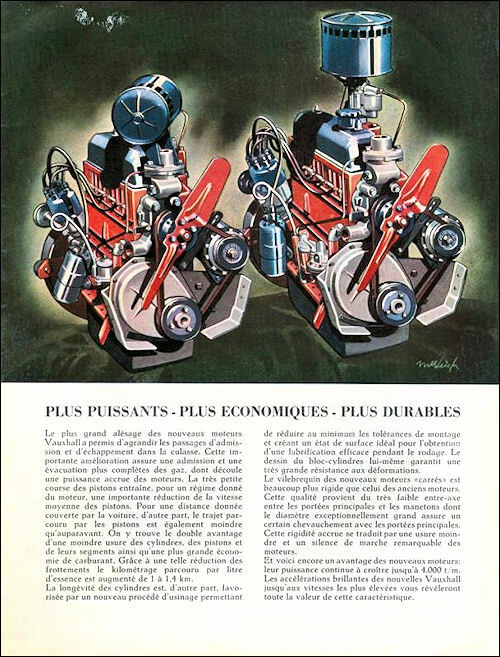 Two engines are in production, a "four" and a "six", both of them designed together, both with the same bore and stroke, and both incorporating a great many identical components. The 79.4-mm. by 76.2-mm. Wyvern unit of 1,507 c.c. replaces a 1,442-c.c. engine with cylinder dimensions of 69.5 mm. by 95 mm. The new Velox engine, with six cylinders of 79.4-mm. by 76.2-mm. bore and stroke giving 2,262-c.c. displacement, supersedes a 69.5-mm. by 100-mm. "six" of 2,275-c.c. swept volume. In each case, the new large-bore, short-stroke engine develops more power than did its predecessor, the Wyvern output going up from 35 b.h.p. to 40 b.h.p., and the Velox power rising from 58 b.h.p. to 64 b.h.p. First and foremost, advantage has now been taken of the abolition of the old horsepower tax to use large cylinder bores and short piston strokes. Where the old engines were of 12-h.p. and 18-h.p. rating respectively, their successors are actually of 15.6-h.p. and 23.4-h.p. rating: but 30 per cent. more piston area has been asked to provide only 10 to 15 per cent. more power, so that in effect the new engines are very lightly stressed indeed. Enlarged cylinder bore dimensions, accompanied by cylinder spacings which allow water jacketing right around every cylinder, have permitted the in-line overhead valves of the smaller engine to be increased in size. Thus, the inlet valve-head diameter on both engines is now 1.375 in., the former figure having been 1.1875 in. on the Wyvern and 1.375 in. 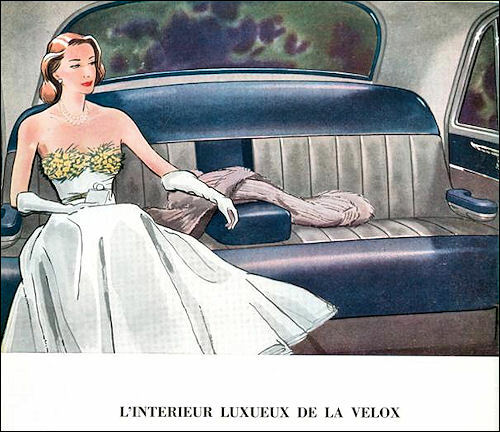 on the Velox: the exhaust valve on both engines is now of 1.25-in. diameter. The new engines are used with exactly the same gear ratios as suited their predecessors, but the improved breathing and reduced piston friction combine together to give substantially improved torque. In terms of rate of wear, the fair basis of comparison is the reduction in total piston travel per mile, and in this respect a 20 per cent. reduction on the Wyvern and a 24 per cent. reduction on the Velox should be fully reflected in improved mileage between re-bores. In terms of fuel consumption at moderate driving speeds, a useful basis of comparison is the total area of cylinder wall scraped by the piston rings per mile, and despite the enlarged bore the reduced stroke cuts this figure by 82 per cent. on the new Wyvern and 13 per cent. on the new Velox, figures which hint at the order of probable improvements in mileage per gallon of fuel to be expected as a result of reduced piston friction. An advantage gained from the enlarged cylinder bore is the possibility of using a simpler type of big-end bearing, the diagonally-split type previously needed to permit upward withdrawal of the connecting rod being no longer necessary. The actual crankpin diameter remains the same on the Velox engine (it is larger than previously on the Wyvern), the reduced crankthrow providing added crankshaft rigidity. The four- and six-cylinder crankshafts are supported in three and four main bearings respectively, and as well as being heavily counter-weighted are individually balanced to a very close tolerance after the flywheel and clutch assemblies have been fitted to them. Flat top pistons are now used for both types of engine, in place of the shaped crowns of the last series of engines. The overhead valves are set vertically in a single line, and the shape of the combustion chamber is such that an area of small clearance between the piston and the cylinder head is provided opposite to the sparking plug: this form of combustion chamber is resistant to detonation (claimed power figures are recorded on 71 octane fuel) and also can burn economically weak part-throttle fuel/air mixtures. 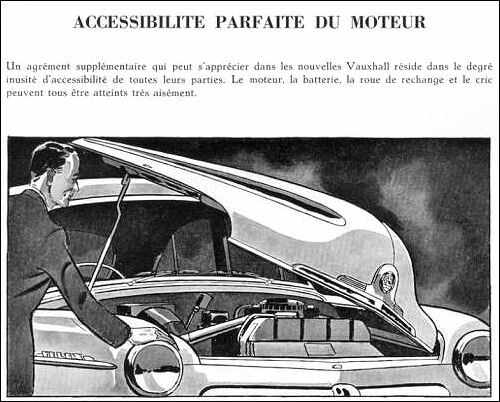 As on other Vauxhall models of the last dozen years, the manifolding arrangements include thermostat-controlled exhaust heating of the inlet pipe. For some while after a start from cold, exhaust gas is diverted by a butterfly valve into a jacket around part of the inlet manifold, but once the engine becomes warm the valve rotates to give an unobstructed exhaust manifold and a cooler induction system. The induction manifolds of the two engines are arranged to keep the downdraught Zenith carburettor vertical, and the horizontal sections of the manifold truly level, when the engine is installed in the car with its crankshaft inclined downwards towards the gearbox: the internal section of the manifold is a compromise, of small surface area but with a flat base, and in fact may be likened to the arched form of a railway tunnel. In the interests of economy, the ignition timing is set by two automatic controls, which not only advance the timing as the speed rises but also provide additional advance during part-throttle driving. For the same reason, these relatively inexpensive cars use one of the more elaborate types of Zenith carburettor, there being an economizer valve in operation during light-load engine running and an accelerator pump to provide instantly responsive acceleration. The lubrication arrangements are both simple and comprehensive, a simplification compared with previous models being the mounting of an oil filter directly on the crankcase without any external piping. The gear-type oil pump is located actually inside the pressed steel sump, and incorporates a non-adjustable spring-loaded plunger type relief valve, there being a warning lamp on the facia panel of the car to indicate any abnormal drop in oil pressure. A triangulated belt drive at the front of the engine transmits power to the 12-volt dynamo, and also to a centrifugal coolant impeller on the spindle of which is mounted a two-blade fan. Coolant from the pump is piped directly to a distribution pipe in the cylinder head, cooling jets being directed on to the exhaust valve seats and the sparking plug bosses. 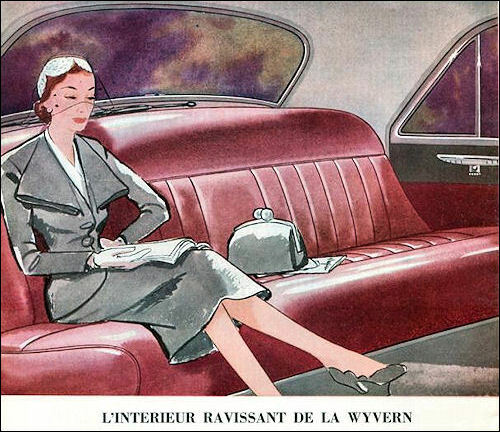 On the Wyvern the cooling system operates at atmospheric pressure, but the Velox radiator filler cap incorporates a spring-loaded valve which will not allow boiling until the vapour pressure has risen to approximately 3½ lb. above atmospheric. 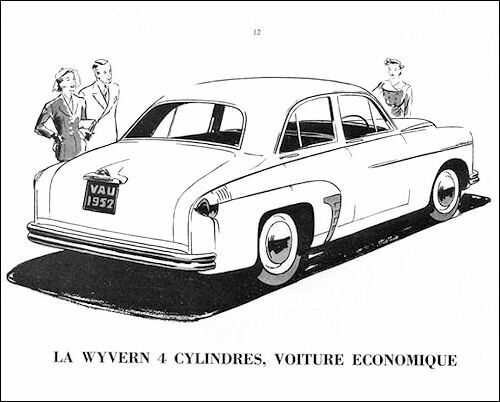 The all-up weight of the Vauxhall Wyvern and Velox models is not appreciably affected by the installation of these higher performance engines, there being in fact a very slight weight reduction in the case of the Velox. It may be recalled that the current models are of chassisless construction, the same full-width steel saloon body being used with both sizes of engine. Apart from new engines, no mechanical alterations have been made to the cars, transmission continuing to be through a three-speed synchromesh gearbox to a hypoid bevel rear axle, and the suspension being by independent coil springs and an anti-roll bar at the front, by semi-elliptic leaf springs at the rear. The sole chassis change to report is that to supplement the integral-construction saloons, Wyvern and Velox right-hand drive chassis with X-braced channel-section frames are being introduced, exclusively for export to certain countries where they will be fitted with locally-manufactured coachwork.